Oh, where do I start? Well, I picked this one up because I love Doctor Who and I love graphic novels. Plus it stars the Eleventh Doctor, so why not? I'm also a big fan of Tony Lee's work, so it was bound to be good, right? Yeah, not really...I start reading the first story, "Space Squid," and a few pages in we are introduced to Commander KATIC and Major FILLION. My first thought is, huh... someone's a "Castle" fan. Slightly annoyed that 1) Lee couldn't be bothered to create original character names, and 2) he underestimated his readers by thinking we wouldn't catch on, I kept reading. Only to find a Lieutenant HUERTAS, Petty Officer DEVER, and Ensign QUINN. Really, Tony Lee? I'm sure if the cast of "Castle" knows about this, they think it's pretty cool to be included in a Doctor Who graphic novel (maybe), but for me it was pretty lame.Overall, the energy of Doctor Who that I love so much just didn't translate well into graphic novel form. The characters were flat and the humor was awkward. There were times where the dialogue and artwork were more indicative of the Ninth or Tenth Doctor, which I found unfortunate because Matt Smith is so distinct. Some of the stories were better than others, but I think I'll stick with watching episodes on Netflix during the show's hiatus rather than reading another one of these. It's Doctor Who, of course I liked it. A grab bag of short Doctor stories. Natasha and I have been really enjoying these. Kevin is now my favorite character. I recommend the graphic novels and the only associated novel I've so far read, Doctor Who: Plague of the Cybermen, as well as the show itself and the vigorous fandom of Twitter as a good shared-family sort of interest. [Veronica loves the show, but prefers her reading more contemporary and realistic]. The graphic novels are providing a good way for me to keep in parallel with Natasha, even though I'm mostly not reading to her anymore.Yes, I'm following in the footsteps of Neil Gaiman and sharing our multi-generational fandom.Library copy. “Space Squid” is fun mostly for its inclusion of Kevin, but otherwise is pretty forgettable [6/10]. “Body Switched” feels equally light, with its main strength being the body switching premise, which is never used to particularly great effect [6/10]. “Silent Knight” is totally shallow but fun & funny; it’s actually a comic without words done well, which is pretty rare [7/10]. Flakov’s “Run, Doctor, Run” is unfortunately even more shallow, so that there’s nothing to it [5/10]. The last two stories, “Down to Earth” and “Tuesday” are both well-written and enjoyable, though I’m not convinced I’ll particularly remember them [7/10]Overall, this whole volume seems quite forgettable. Sadly, I don’t think Series II has been as good as Series I, primarily because of its unlinked, short stories. The third installment was wonderful, full of awesome stories. The first is "Space Squid" which is about, well, a giant space squid. Team TARDIS has picked up a new companion too...a robotic T-Rex named Kevin. The other stories are "Body Snatched" in which there is some pretty crazy/funny body switching, "Silent Knight" a short one with no dialogue about the Doctor saving Christmas, "Run, Doctor, Run" where the Doctor meets a race of gravitational shifters (think M.C. Escher), "Down to Earth" about a former-hostile alien the Doctor finds living in a quaint country town (was really quite sweet), and "Tuesday" which is about Amy writing home to her mom about all of her adventures. All in all, pretty great. I love these comics to pieces. Compared to the previous volumes, this one was quite disappointing!!! The stories vary in quality and the writers use this collection as an experiment in story telling. Some are amazing and hits some emotional chords whereas others struggle. The major plus side here is the artwork, it impresses throughout and even with different styles the quality never drops. Plenty of geek littered Easter eggs including an entire space station crew been named after the main cast of the hit show Castle. Hopefully volume 4 improves in tone and quality....GERONIMO!!!! Another volume containing a variety of stories of various lengths, art styles and tones, ranging from some fairly by-the-numbers run-arounds to a completely silly and nearly dialogue-free Christmas story. While I liked some bits more than others, I can't say that anything particularly stood out, and I don't expect to remember a single detail of this by the time I wake up tomorrow. Just the usual blur of obnoxious, unfunny tongue-in-cheek quips and heavy-handed, repetitive, catchphrase-oriented characterizations. This is six “short stories” about the Eleventh Doctor told as graphic novels, some have better stories than others, some have jarring art. “Space Squid” has a robot t- rex traveling with Rory, Amy and the Doctor, named Kevin. “Body Snatched” has the Doctor’s and Amy’s personalities switched and this is one whose art I don’t like. “Silent Knight” is a nearly wordless adventure where the Doctor and Santa help each other out. (This review covers Series 2 Volume 2 and Volume 3. 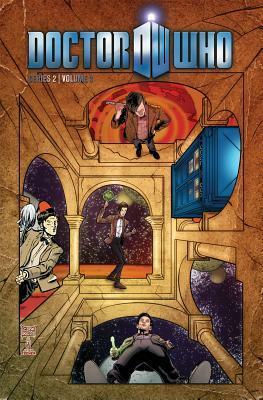 )Entertaining series of Eleventh Doctor adventures. The main writer is a bit shallow with his characterizations, and uses really similar plot twists in the main stories of both volumes, but he still has some interesting ideas. Some of the stand-alone stories in the third volume are rather good in and of themselves, too. This edition is made up of 6 stories. I enjoyed all except Body Snatchers (#2). The art wasn't great and the story was really hard to follow. Too much babble. My favorite stories were 4-6 because I felt they truly captured the spirit of Doctor Who. I love reading this series because I get to have new adventures with 11, Amy, & Rory. I miss them so much! The largest portion of the book, the story illustrated by Michael Dow Smith is terrific. He's a wonderful artist, very Mike Mignola-esque. And that story is just as good as you'd see on TV. The other stories are forgettable fluff. This is just what I wanted in a Doctor Who collection: a variety of stories and artwork. Not every plotline was amazing, but I loved the fact that there were several shorter, self-contained stories in this volume. Definitely my favourite one yet. More of a 3.5, but the Body Snatchers story was really excellent, so let's round up. Who plus nerd-culture references (Castle, Portal, Escher) AND the coolest robot T-Rex named Kevin that you'll ever meet. This is a mixed bag of short stories. I liked them all. The Paul Grist Christmas story is especially fun. A robotic dinosaur companion called Kevin and a Doctor-Amy body swap. What's not to like.